Finding the best color marble for floors and counters involves looking at sample blocks and comparing the shades to those seen in product showrooms. Most of the finest marble tiles are cut from slabs taken from quarries in Europe, Turkey, and parts of Asia. These beautiful stone tiles can be obtained at extremely affordable prices when ordered in bulk. Home improvement centers, floor tile retailers, and construction companies often order large amounts of marble for installation jobs. A reliable source of marble is essential when a larger project is underway. At Stonexchange, we offer full-crate shipments of fine-quality marble tiles to commercial customers across the entire nation. Marble is extremely hard and durable. This rock is formed over millions of years and involves high temperature and enormous pressure. Marble contains veins and swirls that are the result of chemical bonding between different compounds. The combination of igneous and metamorphic processes forms a beautiful natural stone, one that is prized for its appearance and lasting quality. Marble shades vary according to the actual compounds it contains. Shades are usually grouped into several categories including light creams, light primary and secondary colors, and darker shades that contain reds, blues, or black. Building plans often call for the use of one of these shades. At Stonexchange, we stock all of the popular shades of marble tiles, window sills, and thresholds. Marble tiles are generally cut to a thickness of 5/8-inch. Professional cutters take larger slabs and slice them into squares. The thick slabs are also cut into oblong pieces that are in turn shaped into bull noses, raised edges, and backsplashes. These are pressed and glued onto flat sheet tiles to form the edges and corner pieces used in the construction of countertops. Kitchen and bathroom countertops are often constructed with a shade of marble that complements the stone used as a floor tile. Kitchens often have a light shade of marble tile used for the floor surface, with a darker shade used for the countertop. The trick is to find marble that has a vein or swirl pattern suitable for the room in which it is to be installed. For example, a linear vein pattern on light crema marble will not look very good when complemented by a dark marble countertop that has speckled or swirl patterns. The other problem with selecting the proper color has to do with the supply quantity. Large construction companies order marble in bulk for two reasons. The first is to save money on the construction budget allowance. The second is to allow for multiple placement possibilities. The larger the supply on hand, the easier it is to find pieces that match well. This is why installers rely on a bulk delivery service when it comes time to order marble tiles. Wholesalers of natural stone tiles can deliver full-crate orders containing custom-cut pieces or larger slabs, ready for final cutting and installation. Our company solves the problem of how to obtain a good color match for large installation projects. We maintain a huge inventory of all the popular marble shades specified in building instructions. We ship crates directly to warehouses, outlet stores, flooring product retailers, and construction contractors on a regular basis, and we pass the savings on to our commercial customers. This shade is white/gray, popular for use as a flooring tile in offices and government buildings. It is also a great choice for residential foyers and fireplace mantles. Carrara is the perfect choice for installation projects calling for Georgia White, Vermont White, Cherokee, or Oriental. Carrara has a rather bright shine and looks wonderful in both dimly lit and sunlight-flooded rooms. It is easy to maintain and requires little or no cleaning. Crema Marfil is a cream/beige stone that is popular in either honed or polished finish, which works well as a tile for kitchen floors and countertops. Many interior design plans call for lighter shades in the kitchen, and Crema Marfil is an excellent choice. Crema Marfil works especially well when the building plans call for Botticcino or Bursa shading. This marble blends nicely with any other neutral tone and also complements black shades. French patterns refer to marble that is lightly veined and has a mild or warm base color. Bathrooms are often lined with a floor containing light blue or green marble designated as French Pattern. The trick to designing a bathroom involves complementing the jewel tones of the floor or counter with proper borders or inlays. Purchasing marble from a wholesale distributor that also carries marble and glass mosaics/borders will result in the perfect match of shades. It also means combining orders into a single shipment, something that will save the commercial customer a great deal of money. Our product showcase gives customers an up-close look at our most popular stone products. We ship full crates of marble and other natural stone tiles to nearly any address in the continental United States. Because we have a minimum piece count delivery process, our wholesale prices cannot be beat. Our warehouse is filled with thousands of pieces of tile, thresholds, and window sills. 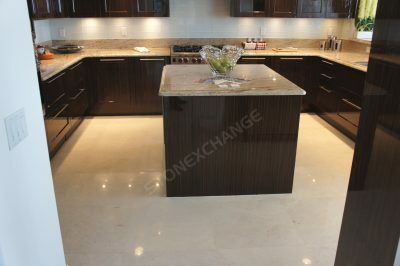 Finding a perfect color match between floor tiles and stones used for countertops, windows, and thresholds is easy when purchasing from Stonexchange. Our company personally inspects each outgoing order to make certain that all pieces match well in terms of color, texture, and patterning. 1. Can I set up a recurring order schedule? Yes. We maintain a large inventory of tile products in our distribution center, and we can schedule repeat orders with ease. The order can be altered at any time, allowing the customer to purchase additional materials or a different type of marble altogether. 2. Do I pay more for non-standard tile sizes? Our prices vary according to the size and style of marble stone. We do not add a separate fee for orders containing non-standard sizes, however. 3. How long does it take to receive my order? If the product requested is in stock in sufficient quantity, we ship almost immediately. We use one of the major trucking companies to send product to the customer, so normal overland delivery times can be expected. Large orders that require processing at our manufacturing plant generally require a lead time of about six to eight weeks. Cutting of tiles, packing, and overseas shipment to our Florida-based distribution center involves coordination between us and our quarrying partners. We have streamlined this process to make the shipping schedule as efficient as possible. 4. Do I pay for broken/damaged product? 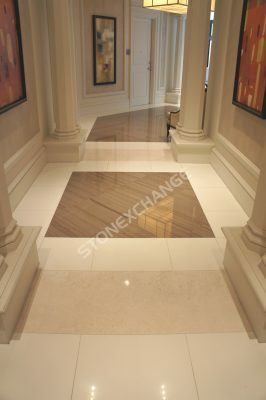 Approximately 10 percent breakage of natural stone tiles is to be expected in the wholesale shipping industry. We strive to minimize breakage by using the most modern packing crates available. Our customer representatives will be happy to design an order detail that outlines the probable breakage amount, and we will show how this is reflected in the final cost of the product. 5. I need only a few pieces of marble tile. Where do I purchase them? We sell large amounts of tile to home improvement centers and flooring product retailers all across the nation. We will be happy to advise our customers on where our products are being sold in a particular area of the country. Marble comes in a wide assortment of styles, most of them having popularly used names that are familiar to installers, flooring contractors, and architects. Before placing an order with us, remember to have the designated marble style memorized. This helps us tremendously when viewing an order request because we can immediately let our customer know if the required amount of product is in stock. If there are larger tile sizes needed, this will have to be mentioned on the order request. Although we can produce larger than the standard 12-inch tiles, we need to know the piece count of the order before we can give an accurate estimate of the delivery date. Most of our tiles are packed in special delivery crates that hold hundreds or even thousands of individual pieces. If the order is for mix-and-match, we need to have an accurate piece count for each type of marble needed. This makes it easier to process the order quickly, decreasing the delivery time substantially. Our knowledgeable sales staff is ready to field questions regarding the different styles of marble, how long it takes to process an order, and how the product will be shipped to its destination. Feel free to contact us for complete details on how to obtain the world’s finest marble tiles and countertop materials at the lowest available prices. Remember, we ship bulk orders all across the nation and can handle large orders for thousands of marble tiles with ease. Our direct import/wholesale marble tile distribution business has been built on the satisfaction experienced by our commercial customers, and we are ready to provide new customers with top-quality merchandise at the lowest prices in the industry. The legendary Calacatta Gold Marble Tile from Italy. This is the very best selection available in the market. Add value to any project with this exclusive product.